“Touchdown! My new address: 67P!” It was 4:07pm in London when the little spacecraft Philae posted this historical tweet from space. 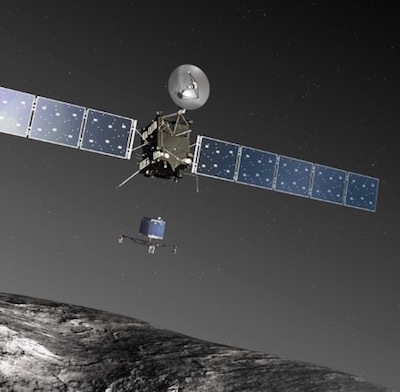 For the first time in human history, a robot had landed on the surface of a comet. This was the result of an incredible spatial adventure that started ten years earlier. In Rosetta’s luggage, there is Philae, a small robot that only weights 2 grams in space (100kg on the Earth). The goal is to land Philae on Tchouri, a comet that looks like a ginormous granite peanut, the size of Mont Blanc. The task is a really tough one: once Philae is separated from Rosetta, its path cannot be modified. It has to be dropped at exactly the right time, so it can land in the best possible place. Simple genius. It is precisely 7:08am in the UK on 12 November when the ESA confirms on Twitter that the big day has come: European scientists are finally going to release the robot, after following the comet for three months. Around 9am, the special probe Rosetta parachutes Philae, 20 kilometres away from Tchouri. And for seven long hours, the robot goes down at 2mph (the speed of a walker) to the comet, which whizzes along, escorted by Rosetta, at 11 miles… per second. Philae’s adventure in space is watch live by millions of people. 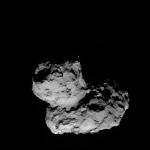 On twitter, the users support the robot in its mission (#Cometlanding) – and when you think this social network did not exist before it took off… From Rosetta’s account, “postcards” of space sent by Philae are sent on line. Finally, at 4:05pm, the robot lands. A third time lucky landing, because the two harpoons that were supposed to maintain it on the ground did not work. The little robot bounced, but ended touching down Tchouri. Mission completed. This amazing achievement will now allow us to make some revolutionary discoveries. Comets are very rare and they are very old (approx. 4.5 million years old); they have not changed since the formation of the solar system. By studying the composition of Tchouri, scientists might be able to understand better not only the origins of the solar system but also ours. Philae could give us the key to how life on earth began. This unprecedented exploit received the applause of NASA: “All our felicitations to the European Space Agency for its success.”François Hollande also saluted this incredible achievement by adding: “For all of you out there who might ask yourselves what is the use of Europe, Rosetta has given us the best possible answer.” Thank you Europe.